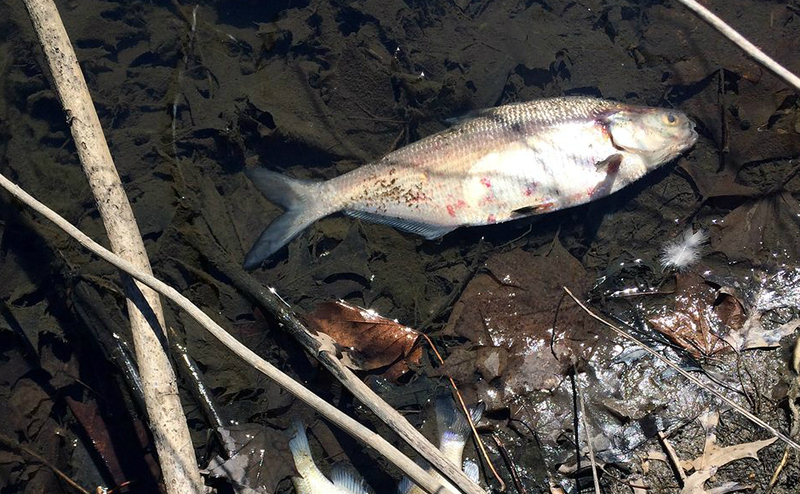 Photos of a fishkill in Newton Creek. Credit: Lorraine Prince. A researcher with the New Jersey Division of Fish and Wildlife said the recent death of some 100 bluegill sunfish in Nichol’s Pond may be the result of a waterborne illness. As the winter weather turns to spring, nature-watchers typically welcome signs of new life emerging in the warmer months. But just a few weeks ago, environmentalists were concerned by the discovery of a fishkill in Nichol’s Pond—a mass die-off of animals that can potentially indicate more serious problems in an ecosystem. Among the first to document the incident was Lorraine Prince of Collingswood, a longtime volunteer with the Newton Creek Watershed Association. Prince said she’s seen fishkills throughout the creek. Regardless of the cause, she finds each of them concerning. Prince, who is also monitoring the county-led Newton Lake dredging project, worried that whatever had killed off the fish could present future problems. 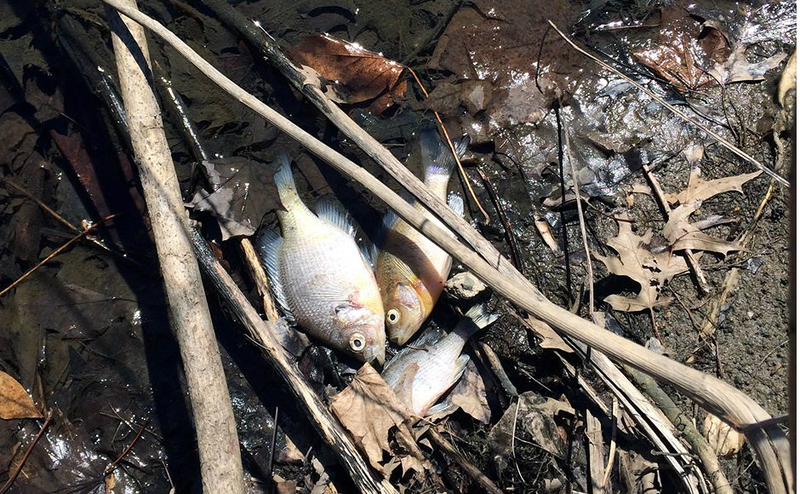 Fishkill at Swartswood Lake with (a) dead sunfish and (b) bluegill and pumpkinseed sunfish. Originally published: Wiley Journal of Fish Diseases, March 4, 2017. But according to Jan Lovy, research scientist with the New Jersey Division of Fish & Wildlife, the fishkill in Nichol’s Pond was likely caused by a commonplace bacterium, pseudomonas mandelii. More than 100 bluegill sunfish likely succumbed to the germ, which Lovy said thrives in cooler temperatures, and which was present in every specimen taken from the pond. Lovy has previously encountered the bacterium in fishkills in New Jersey’s Assunpink and Swartswood Lakes, as well as Lake Musconetcong, and published a study of his findings in the Wiley Journal of Fish Diseases. “These bacterial infections are fairly common in the springtime,” he said. “The sunfish are somewhat stressed from overwintering. “When you have cooler water temperatures and a stressed population of fish from overwintering, this can cause systemic infections,” Lovy said, adding that the bacterium is fairly observable as a seasonal occurrence. Prince advised that anyone who observes anything out of the ordinary in the watershed area to call the state Division of Fish and Wildlife at 609-292-2965.